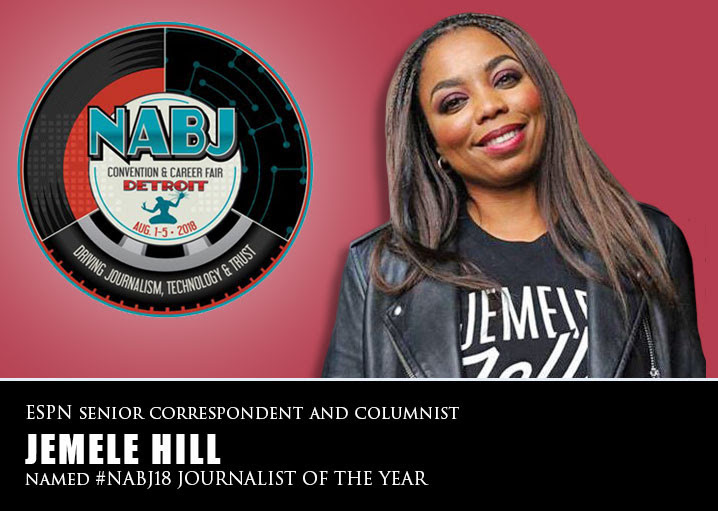 Washington, D.C. (May 21, 2018) — Jemele Hill has been selected as the 2018 Journalist of the Year by the National Association of Black Journalists (NABJ). The annual award recognizes a black journalist who has amassed a distinguished body of work with extraordinary depth, scope and significance to the people of the African Diaspora. Known for her provocative commentary on what’s happening in sports and in the news, Hill is a senior correspondent and columnist for ESPN’s The Undefeated. She uses her platform to address national, social and cultural issues, in addition to sports. Hill nearly broke the internet last year when she criticized President Donald Trump. She also, taking up the NABJ spirit of advocacy, addressed athletes’ rights to take a knee to protest police brutality. She did all this while co-anchoring a groundbreaking rebrand of ESPN’s marquee show SportsCenter, or SC6, along with fellow NABJ member Michael Smith. This is the biggest accomplishment of my career. Hill’s words drew widespread criticism, and even the ire of the White House, which called for her firing from ESPN. Hill withstood the backlash. She also pressed on after a two-week suspension from ESPN in October 2017. This “second violation of [ESPN’s] social media guidelines,” occurred after Hill’s highly-publicized Twitter response to Dallas Cowboys owner Jerry Jones’ threat to bench his players who didn’t stand during the National Anthem. Hill’s suspension then became part of the narrative that started with former San Francisco 49ers quarterback Colin Kaepernick, who began kneeling before games in 2016 to raise awareness about police brutality. In both instances, a hashtag, #IStandWithJemele, surfaced. Hundreds of thousands used their social media platforms to support Hill. Supporters included her peers, athletes, politicians, and celebrities. Hill has said publicly that while she has no regrets, she is reflective about her experiences in the past year. In each instance, she had the full support of NABJ. A Detroit native and Michigan State University graduate, Hill joined ESPN in 2006 as a columnist. Soon, she began appearing on several ESPN TV programs including The Sports Reporters, Around the Horn, Outside the Lines, SportsNation and Highly Questionable. She also broke new ground at the sports network with the popular podcast-turned-TV-show “His & Hers,” with Smith. Hill previously worked at the Detroit Free Press and the Orlando Sentinel, where she was the only female black newspaper sports columnist in the U.S. at the time. “Jemele is the epitome of what a black journalist should be,” said Marlon A. Walker, NABJ’s vice president of print. Hill will be honored in her hometown at the NABJ Salute to Excellence Awards during the NABJ Convention and Career Fair on Aug. 4 at the Detroit Marriott at the Renaissance Center. She is also the honorary co-chair of this year’s convention. NABJ Convention registration and Salute to Excellence Awards tickets can be purchased here.